A couple of months ago, I was lucky to spend a few days learning about Bavarian cuisine. I learned quite a lot of new things, but sadly did not get the chance to taste many of the dishes we prepared. 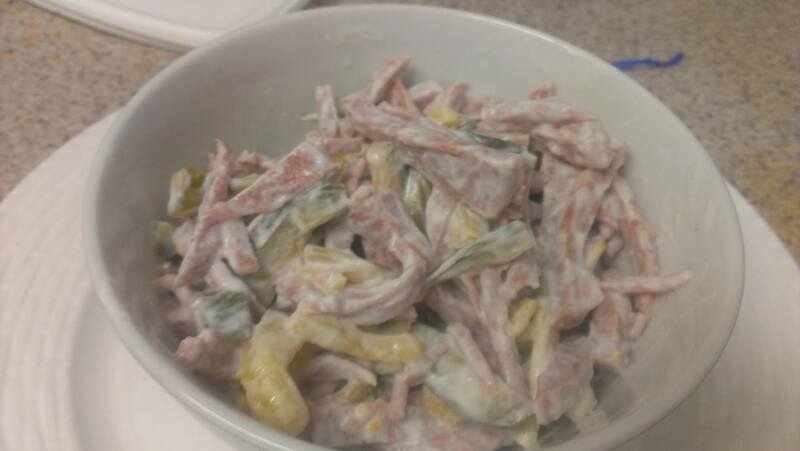 One of the things I wanted to try so badly was the Fleischsalat, German meat salad. The recipe was super easy. I just wasn’t sure exactly how it was to be served, by itself or on a roll. The answer is both. A few weeks after getting my culture on a friend and I stopped by one of our favorite stores, a strange little place that had all kinds of weird random items for extremely great prices. It seemed to be too much of a coincidence that they had just got in a shipment of German products including mustard and beerwurst, so of course I snagged me some. I thought this would be perfect for the Fleischsalat, and right I was. 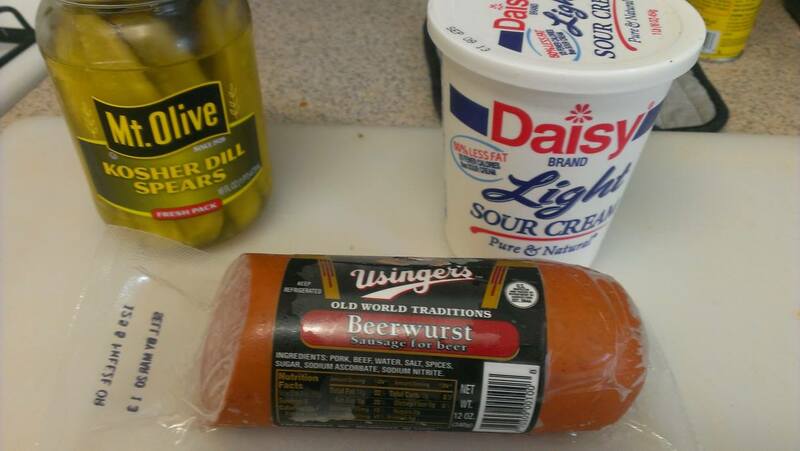 Beerwurst is kinda like a summer sausage, only softer. And more garlicky. It has a slight red tint to it and is seasoned with pepper, paprika and mustard seeds. Its also delicious. I decided that I would use half to make a small batch of Fleischsalat and save the rest for a meat snacker platter for a brunch later on. My beerwurst was frozen so, I just thawed it enough to cut in half, and tossed the rest back in the freezer. It kept pretty well, and will only last a week once opened in the fridge. Slice the Beerwurst length wise into thin stripes. Then cut these pieces into 3mm strips and cut in half. Toss lightly with sour cream, throw in a splash of pickle juice if needed and a few splashes of the Maggi. Maggi is strong! If you can taste the Maggi, you have put to much! Now you have yourself quite a tasty treat. Serve on a bed of lettuce, a beautiful crusty roll or devour straight from the bowl.